No matter what type of eggs you are incubating it is important that you begin to prepare everything several days ahead of time so that the incubation goes as smoothly as possible. Proper care of the hatching eggs and proper preparation of the incubator will increase your success at hatching. You can collect eggs for up to 10 days before the incubation to get the amount you need. We tend to go closer to 7 days of collection because we have done many incubations and kept track of how the eggs did and the hatchability decreased with the eggs that were 8-10 days old. If you are only doing a small amount of eggs, then it may only take you a few days to collect all that you need. 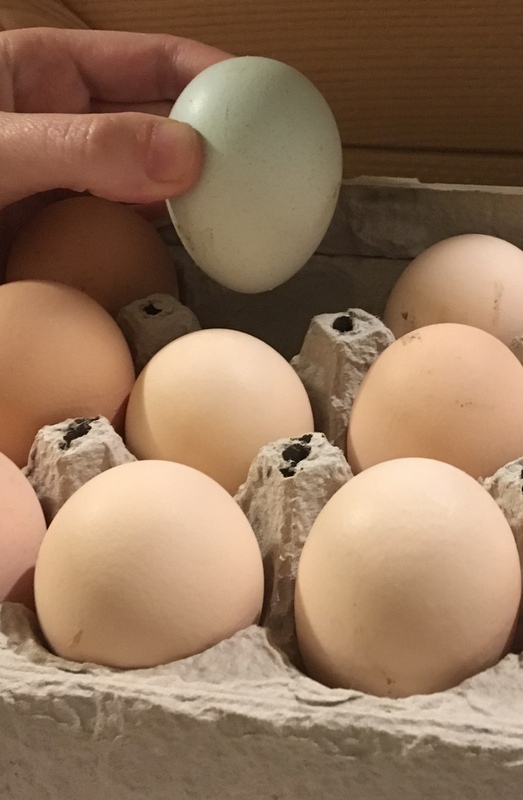 Store your hatching eggs in a carton with the tips down, fat end up, so that the air cell can settle in the right location. 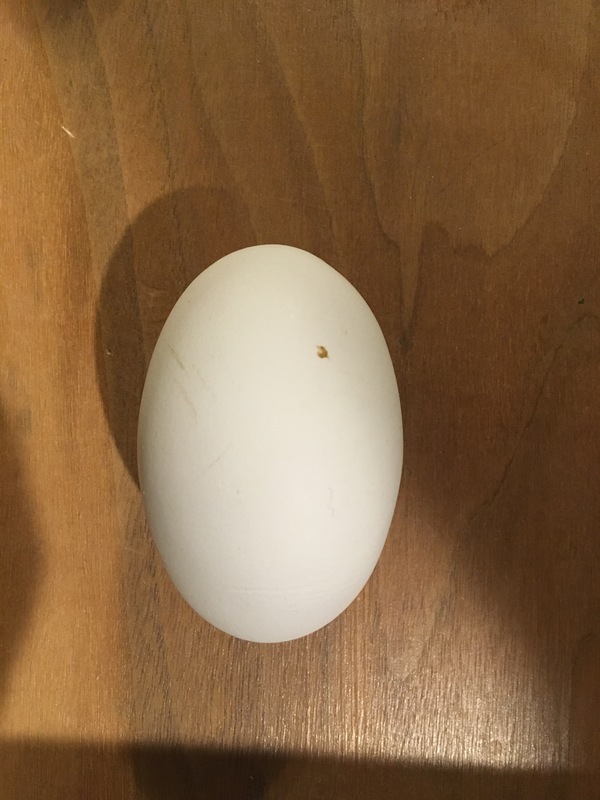 Sometimes it can be hard to tell which end of the egg is the fat end and which is the tip. Like this one. When that happens we candle the egg to find the air cell. The air cell is the end that needs to go up. 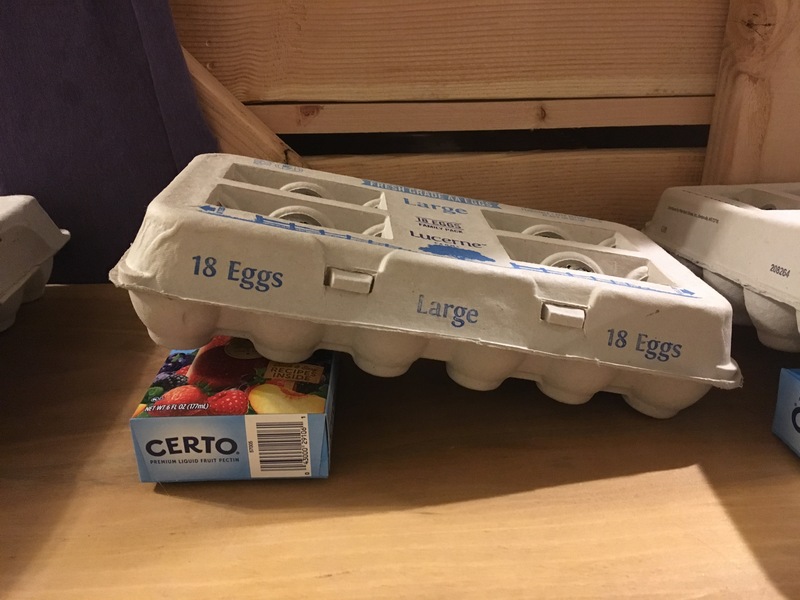 Also, set one end of the carton on a book or something to elevate it and switch which end it is twice a day to help “rotate” the eggs while they wait. Store the carton in a cool room in the house, ideally around 60 degrees. We store ours in the basement. When you are ready to put them in the incubator, first bring them to room temperature by letting them sit in a warmer room (70-72F) in the house for a few hours. Then put them into the prepared incubator. 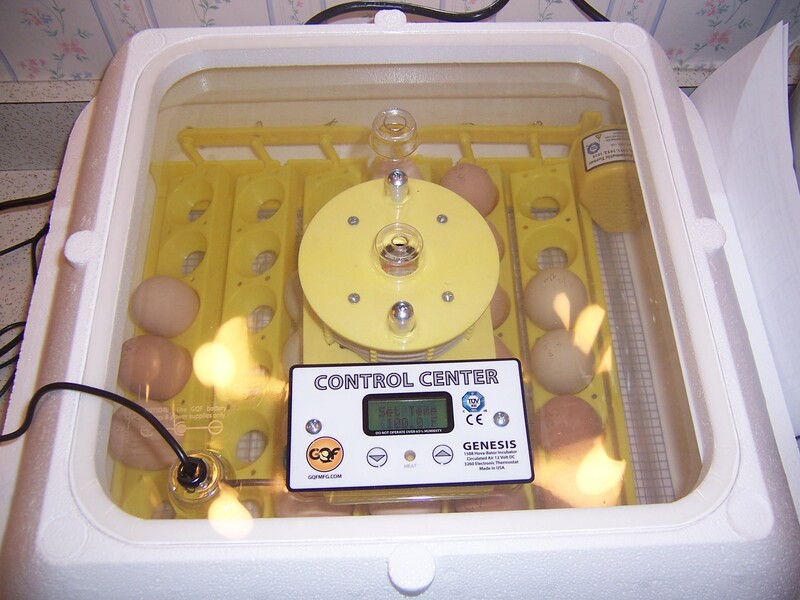 You should get your incubator up and running 3-5 days before you plan to put eggs in it. It can take time and many adjustments to get the temperature and humidity just right and you don’t want to rush it. Get it set up and first get the temperature setting right. Always use two thermometers to confirm your temperature. We have, sadly, had to learn this the hard way and had an incubator full of eggs die at about day 7 because the thermometer we were using was inaccurate and it wasn’t warm enough for them to develop properly. Don’t make that mistake – always have two thermometers. For chicken eggs you are aiming at 99.5F. Once you have reached the right temperature, then add water and use a hygrometer to get the right humidity. You want 40-50% humidity for the first 18 days of the incubation and then 65-75% for days 18-21, or until the hatch is complete (can go to day 24). If you have never used your incubator before I would suggest that once you get the humidity right for the first stage then try to bring it up to the higher humidity for the last stage to give yourself an idea of how much water you will need and whether or not you will need to use other methods to bring it up high enough. Then bring it back down to the proper starting humidity before you put the eggs in. This is another reason it is good to start days in advance so you can be sure you know how to use the incubator and achieve the different humidity levels you need. 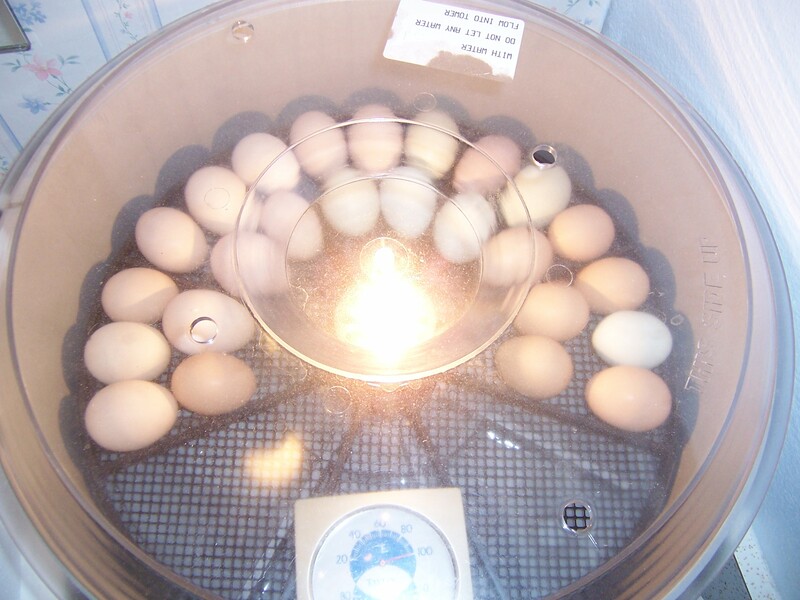 Once you get your temperature and humidity right and holding steady the incubator is ready for the eggs. If you have not finished collecting them you can just leave it running and it will help you get an idea of how much effort is needed to keep the humidity stable each day. 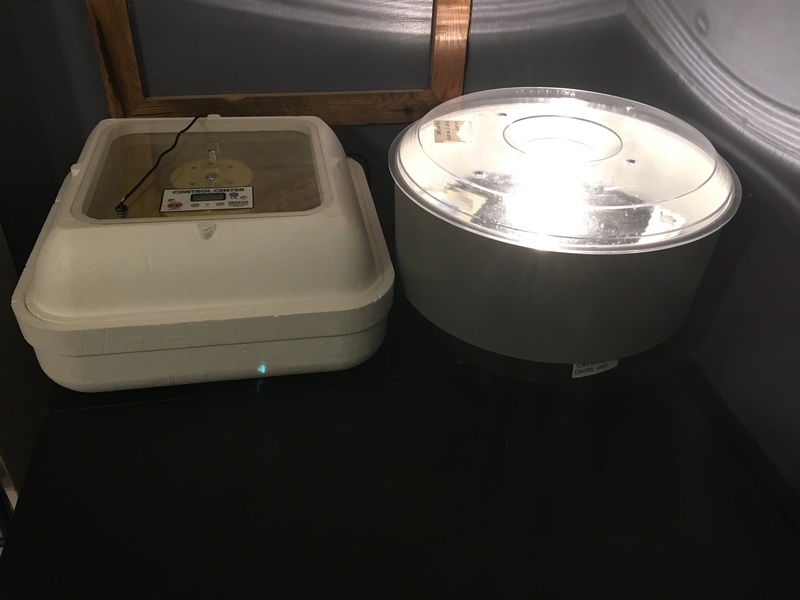 One last thing to do is to be sure that if your incubator uses a light bulb to heat, such as our Top Hatch in the above picture, be sure you have a second spare light bulb of the same size and wattage. That way if something happens to your bulb you can quickly replace it and not risk all the chicks dying during the incubation. Properly preparing ahead of time is a very important key to a successful incubation and hatch. This entry was posted in Chicken Breeding Program, Chickens. Bookmark the permalink.